First off... I'm a fan of Jon "Bones" Jones and I'm not in the camp of those who are "butthurt" because fans don't like Jon "Bones" Jones, I'm perplexed at the never ending stream of creative and invalid excuses to dislike him. The writing is and has been on the wall for quite a while now... and with the progression of his career and challenges put before him, there's always a new set of reasons to dislike him even though he meets and exceeds those challenges in a highly professional and respectful manner. First it was "who has Jones fought ?" Then many claimed that Bader was right on par with Jones and would give him a challenge. Now that he very easily defended his title against Rampage with a 4th round RNC submission, there appears to be more reasons than ever to dislike the guy... now added to the list of reasons are his "tactics" or "antics" in his last fight. He not cocky, he's confident... in his fight against Rampage he showed Rampage a lesson from virtually every page in his book of game plans, including the bizarre crab-walk in the opening round of the fight... and when questioned about the maneuver in the post-fight interview by Rogan, Jones explained his reason for that maneuver. He's certainly not tactless... that title is owned by Lesnar. He's never disrespected an opponent in the octagon in the manner that Anderson Silva has. He's not cocky or disrespectful... that's the definition of fighters like Lesnar, Bisping, Mayhem Miller, Rashad Evans, Chael Sonnen and many U.K. fighters. So all of the reasons for the Jones hate are invalid in my opinion, and no matter what Jones does in regard to exceeding the challenges put before him in a highly professional and respectful manner, it's obvious that those who choose to dislike him are using nothing more than excuses to validate their position... because now that he's not only destroyed Shogun Rua and defended his title against Rampage, the current prevailing argument in the minds of those who seek reasons to validate their dislike of Jones is... that in order for Jones to validate himself there is a list of fighters that he "has to beat" before he receives his just due. Even if and when that occurs, the validation is not gonna happen at that point either because as I said above... in the minds of Jones' detractors there will be another set of excuses and reasons that he doesn't deserve respect. 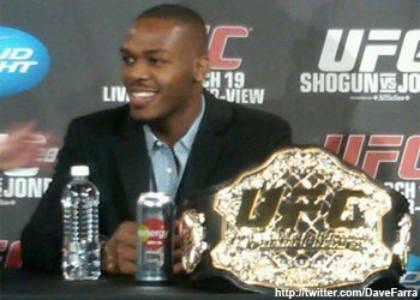 Like him or not, it's just as Joe Rogan stated; "Jon "Bones" Jones is perhaps the greatest talent MMA has ever seen." If you don't like my opinion, I have others... (that you probably won't agree with either). This is an article that I wrote supporting Jon Jones early on... but I have since changed my mind about him. As it turns out... I guess he is a bit of a phony ! I was wondering WTF I was reading lol. It was a great piece when I wrote it 2 1/2 years ago before Jones came out from behind facade he was hiding behind and showed his true colors ! Good Christ, Rich! You made me choke on my dinner, reading that! I honestly felt that way about Jones initially... but he's proven to be a bit of a phony, and he just keeps making himself look worse every time he speaks. I already disliked him leading up to the Shogun fight. I seen how he changed then. I knew everything had been a facade. I haven't come across many people who actually like Jon Jones the person, and because of that, many people don't like him as a fighter either. I think it's safe to say at this point, that a lot of people are looking to see Jonny "Bones" Jones lose the belt by KO... maybe he'll become more humble after that, like he was when he first started fighting in the UFC. I'm bumping the Jon Jones threads up for Muyanzi Reid... I was chatting briefly with him in the comments section about Jones in one our videos. I just found this article from the keywords area, and I was one of the fans who felt Jones was a phony from the beginning. I couldn't put my finger on it, but he didn't seem genuine. I wrote this article almost 3 years ago, and I'm sure there are a lot more people who agree with you now than at that time.